Sneak Peek: "Personal Style & The Perfect Wardrobe // A Workbook"
As many of you know, I have been working on a special project for the past couple of months and have been awfully secretive about it :) But now, finally, with the bulk of the work finished, I can tell you guys all about it! UPDATE: The workbook is now available, check it out here. It’s a one-stop guide that walks you through the entire wardrobe building process, from the first baby steps to the final tweaks. It’s strictly not a read-through-in-one-go-book, but a WORK-book: A very hands-on road map that shows you how to upgrade and overhaul every aspect of your wardrobe step-by-step. 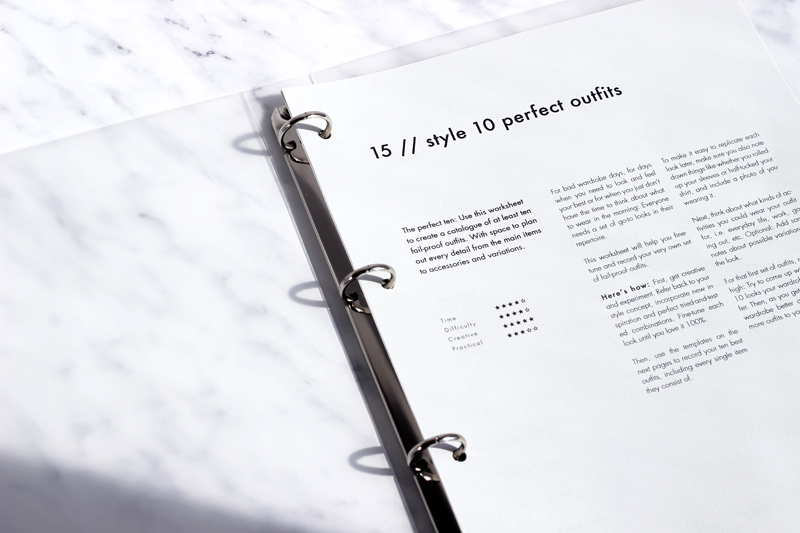 With detailed instructions, lots of tables, tests and prompts for you to develop your ideas and templates to help you plan out everything from your style concept to your capsule wardrobe, fine-tune your go-to looks, create a brand guide for your style and more. Perhaps the number one question I get from readers is: “I want to define my style and upgrade my wardrobe, but where do I start?” Or, once they’ve already made some progress: “What’s next?” Both defining your style and building the perfect wardrobe are very creative and multifaceted tasks that require you to dig deep and consider lots of different aspects, from your unique aesthetic ideals to your lifestyle. I write about all of these on this blog, but especially for a beginner it can all seem a bit overwhelming. That’s why I wanted to create an all-in-one solution that covers all of the main steps in detail and not only shows you how to build a better wardrobe, but takes you by the hand and walks you through each step. The idea is that you can complete most (if not all) of the creative development within the book, so once you are done, you will be left not only with a super comprehensive resource for your entire personal style + wardrobe, but also with a detailed log of your thought process and original inspirations that you can refer back to whenever you want to remind yourself of your goals and progress. Who is the workbook for? a) For complete newbies who want to kick-start the process, discover their style from scratch and create a solid foundation which they can then build upon. b) For readers who have already made some progress, e.g. identified some key style elements and detoxed their wardrobe, and now want to take it a step further. For them the workbook provides lots of opportunities to finally tackle some of the larger milestones of the process and turn rough ideas into concrete concepts and action steps. What format will the book be available in? The workbook will come as a PDF file only, not as an ePub or paperback. Why? Because to really get the maximum benefit from the workbook you need to print it, complete the exercises, fill out the templates, add notes and sketches, shuffle pages around, write all over them, etc. The PDF format allows you to reprint the individual pages of the book as many times as you need, in case you want to redo a page or need more space for your answers. You will also be able to reuse each of the worksheets multiple times, for example at the beginning of the new season to redefine your style concept for the upcoming months and build a new capsule wardrobe. The PDF will be in black & white, which means you can customize your workbook if you like and make it your own, for example by printing it on coloured paper stock, using a different colour or a pattern for the cover page, and so on. In the launch post I’ll show you a couple of examples for how to customize, organize and store your workbook and some completed sections as well. You will also be able to download a free sample section. Launch day is the 5th of August! I’m still finishing up little bits here and there and incorporating some last minute feedback from the beta testers, but, yes, August 5th is when the workbook should/will be ready! Leave your email address here if you want me to send you a quick note once it's available. P.S. Thanks again to all of my lovely beta testers for taking the time to read the workbook and try out the whole thing from start to finish. Your feedback has helped a ton!